A new ICM poll for The Scotsman puts support for independence at an eight year high of 51%. "The SNP would win more votes than Labour on the first, constituency, vote - 32 per cent to 30 per cent - and the two parties would be tied on 28 per cent for the second, list, vote. This would give the SNP 37 seats, up ten from 2003, and Labour 41, down nine from 2003." The SNP would need to form an alliance with the Liberal Democrats and Greens in order to be able to govern. The LibDems are set for big gains and may end up with 25 seats. The good news for Tories nationwide is that this might help to keep the ineffective Ming Campbell in place as leader. "Today's poll indicates that the Tories will lose one seat, down from 18 to 17, and will lose votes, down 2 per cent on the constituencies and down 1 per cent on the regional lists." Next May will be a difficult period for David Cameron. The party may fare slightly better in elections for the Welsh Assembly but a no-progress result in Scotland will overshadow the gains Conservatives are seeing in England. The consolation for the embattled Annabel Goldie is that the Tories will make gains in Scottish local government. The move from election by first-past-the-post to proportional representation (via single transferable vote) will produce the election of many new Tory councillors and probably give those councillors the balance of power in some local authorities. Murdo Fraser is the favourite to assume the leadership of Scotland's Tories once the elections are over. How sad. Whilst the demise of fptp may bring us some minor gains in the local elections I think that's a disaster too. It really is hard to be a Unionist these days.Nobody in either England or Scotland seems to be making the case for the Union these days and I really do fear that its future is under threat. So why do SNP end up with less seats than Labour? What sort of a system is that? Scottish independence = English independence, yippee, say I.
Bye then. Remember to remove your hand from the till when you leave. "The good news for Tories nationwide is that this might help to keep the ineffective Ming Campbell in place as leader"
Hang on, if he' quietly winning seats is he really that ineffective!!! The Scottish Conservatives will probably make a modest gain in the Parliamentary elections, as polls almost always understate their support. I'd expect to see them on c.20 seats or so. WRT the local elections, any gains are likely to be very modest, unless overall support increases substantially. FPTP works against the SNP at local level, but not against the Scottish Conservatives. It would be sad to see the Union break up, but sadly, so many Scots seem hell-bent on creating a kind of Cuba North of the Border. With your quote in mind, should we also be advocating independence for the north east and north west of england? Both these areas receive more money per head than Scotland does, due to the Barnett formula. Deividas - sadly, that may be an idea before it's time. As an SNP candidate I can tell you that this poll does reflect pretty much the sort of reception we’ve been getting on the doors. Althugh there are obviously local factors to consider. The situation for the Scottish Tories is fairly dire for the Parliamentary elections and the local election will be ok for them in patches of the country. There will still be some areas where you simply won’t see any significant number of Scottish Tory Councillors. Perhaps you shouldn’t get too down hearted about the Tory result in Scotland affecting Cameron as in Scotland I suspect the story of the night will be the collapse of the Scottish Labour Party. Polls like this one show the SNP riding high and its public knowledge we’re already had discussions with the Greens about a possible ‘confidence and supply’ model of coalition involving them after the election. So Labour out of Government in Scotland and a referendum for Scottish Independence in the pipeline. Then consider the local elections. At the moment Labour control most councils in Scotland, with STV they are going to take a hammering losing councils and councillors all over the place. Next year’s elections the Tories aren’t going to be the story - the drive on to Independence and the collapse of Labour in what is meant to be their strongest heartlands will be. I've yet to meet anyone vaguely rightwing from the SNP Ben. Most seem to attack Labour from the left. There is a very small number of right wingers in the SNP, but it is predominantly a left wing party. The choice in Scotland seems to be between centre right (Conservative), centre left (Labour and Lib Dems), left (SNP), and loony left (Greens, SSP, Solidarity). There can be no political culture in the democratic World that is so left wing. I think this is all really exciting. I really can't wait for the replacement of a centre-left coalition with another centre-left coalition that includes a partner from the previous centre-left coalition (and an anti-growth party)and in which the main partner of the new centre-left coalition voted against the previous centre-left coalition a mere handful of times. Also...Davie at 12.33: Aren't you constitutionally forbidden from talking to Tories? Away with you man before Alex and Nicola catch you here and accuse you of becoming anti-Scottish! Why does some election system or other seem to change every few years? We should not be happy that the system change might benefit us, we should be asking who gave the right to whom to change the rules in the middle of the game. And why does it always change in the direction of proportional representation ? As a party surely we should be far more vocal in defence of first past the post or we will lose the argument by default. What is really worrying about all this is that the Greens could well hold the balance of power after the May elections. They are barking mad: hard-left, anti-car, anti-growth, fanatically pro-wind turbines on every hillside. If they are anywhere near power what's left of the Scottish business community will simply slip off down South and we'll be even more dependent on the State. If the SNP were at all credible as a pro-growth party they would renounce any future pact with the Greens instead of stupidly refusing to deal with the Tories. Another thought about possible Scottish Independence - someone commented that 'don't forget to leave all the 'handouts' behind when you close the door' - yes?. Well the thought is - if we had a Scottish PM at THAT particular time of break-up, you might as well forget about collecting those 'handouts' back again, because for sure the Scottish PM would make sure one way or another that the money continued to poor into his homeland, and especially if the Deputy PM was Scottish as well!!!!! "Scottish independence = English independence, yippee, say I." Scottish independence = the English losing their control of the northern part of the home island. Maybe we can live with that, at least for the foreseeable future, but it's not a cause for celebration in the view of this Englishman. If Ming Campbell is ineffective as Leader why are the Liberal Democrats forecast to do so well in Scotland? Let's hope that the Scots finally grasp the nettle and vote for independence - preferably sooner than later. They can then continue down the path towards a centrally planned socialist republic and leave England to get on with its own affairs. A bonus would be that, without their cohorts from north of the border, Labour would probably have great difficulty winning a majority at Westminster in future elections. Timberwof – per this poll they’re not doing massively better than ourselves. They are on 15% in the first vote and 17% on the second vote (at the general election they polled around 22% IIRC). This compares to 14% and 14% for us. A lot comes down to how the vote is distributed though. As Sean points out above the Tories in Scotland are often understated in the polls In the run up to 2003 we were as low as 9-10% eventually polling about 5% higher than that. At the same time the SNP often polled in the high 20’s and low 30’s. I think Sean is right to point to around 20 seats. But there is still a long way to go so much could change. The SNP are predominantly left wing although the right wing has become a bit more influential recently - Jim Mather, Fergus Ewing etc. Also most of their seats were formerly ours and are composed of rural middle class electorates - you would weigh the Tory vote in North Tayside/Angus etc if they were in England. 1. Voters outwith the central belt - Labour's dominance in the central belt and consequently in Scottish government causes resentment in the outlying areas. Indeed if you look at electoral maps Labour do pretty badly outwith the Central belt. Our success in North East Scotland in 1992 was based on a "dont let the central belt dominate us" style campaign and we ended up gaining Aberdeen South, regaining the by-election loss in Kincardine and Deeside and almost retaking Gordon and Angus. Perception of being the Party of the periphery helped the Lib Dems in SW England and has aided the SNP in Scotland - in the new Scottish context where the Tories are an outsider we could fulfil this role. 2. Cultural Unionists - we used to get these voters especially in the Central Belt. It is not to everyones taste to point this out but since but since Central Scotland is so leftist and class conscious we need an alternative means of attracting support here. Opposing denominational schooling in the state sector is a perfectly legitimate and liberal way of doing so especially as they are utterly discriminatory and have perpetuated sectarianism in Scotland. Politically, it would strenghten our list and local government position in the Glasgow, Central and West regions as well as our FPTP position in Ayrshire, Eastwood and Renfrewshire and other areas near Glasgow where we used to do well. In the right context this can be seen as a moderate and liberal policy and a fair and morally acceptable way of reconnecting with this section of the electorate. "They can then continue down the path towards a centrally planned socialist republic ... " Thanks, I've always wanted England to have a porous land border with a centrally planned socialist republic. As usual Sean Fear is correct in predicting the result next year - very modest gains for Tories at Holyrood but few new Council seats thanks to STV. Fear not (or cheer not u english nationists) the SNP will not win the election. The Scottish media always boost them up before an election and then rip them apart during it. An independence poll would be lost by the nationalist about 70/30 too. I am a Scot and a Unionist. I have never contemplated independence as having any attraction. In fact, secession from the Union is the greatest threat to the long term INDEPENDENCE of Scotland, because it will deliver the certainty of socialist government from Edinburgh and ever-greater reliance upon socialist Brussels. It will end up, surely, as a satellite state within a federal Europe, conservative England having long since left the Brussels charade. Will England invite a sorry and embarrassed Scotland back into a Union a few decades hence? Will the resentful and stubborn Scots who voted for "independence" be able to swallow their pride and cast their vote a different way next time? Will conservative England, by then a small-state, low tax economy with control over its borders and its way of life, feel that an influx of 60 Scots MPs, of various socialist hues, be of benefit to its people? Think about it, Scotland. There is no "independence" to be had here, but only membership of the alphabet soup that is Europe. And your position in the pecking order, like your geography, will be somewhere between Luxembourg and the Faroe Islands. As a Scot living in England and a visceral Unionist it is a very sad state of affairs indeed. The difference between previous over-estimates of SNP support and now is the cultural and political changes that have happened since devolution. Culturally the independence/nationalist movement is dominating Scottish media and other pillars of Scotland. Look at newspapers such as the Courier, previously right wing and Tory and now pretty much SNP leaning. It is pervasive and is shaping young Scots towards independence. Similarly, there is a thurst for control. The SNP's argument that devolution doesn't work because it hasn't gone far enough is making political progress. People now want control of their own affairs. Politically, the Lib Lab coalition is a disaster. The parliament is openly mocked and people are looking for an alernative. In England that would be us, in Scotland it's the SNP. If I had to predict I'd suggest that the SNP and a rainbow coalition of Greens, Solidarity, SSP and probably some Liberals will form the executive. They will lobby Westminster for an early independence plebiscite, which if the SNP have a majority of votes it will be difficult to resist. I suspect such a referendum would be carried. A tribute to Blair and Brown's commitment to John Smith's legacy - making me a foreign national in my own country. How apt. This talk of the SNP working for Scottish "independence" is rubbish. You can't have "independence" within the EU. The SNP is no more than a collaborator in the formation of a "Europe of the Regions" run from Brussels. The European dimension is basically a non-issue. The spectre of a European super-state dissappeared with the French and Dutch referenda last year (of course the French aren't in favour of 'Europe' unless they can run it). In the long run the Anglo-Saxon 'plot' to prevent 'deepening' by 'widening' worked very well. What we've got is a loose (and loosening) free trade area which I assume most Tories can live with. Unless y'all want trade barriers with our nearest markets? The problems really started with the way the nations of the UK came together, it didn't start in 1997 or 1999 but centuries earlier, even long before 1707 and involves a mixture of interests of aristocracy and royalty in the different nations and religious disputes and various wheeling and dealing, and especially the rather ad-hoc way that especially British constitutional affairs have always been done, so it is quite valid to be a Unionist but to feel that the way the Union came together could have been handled far better and greater efforts made to avoid setting in motion constitutional inequities that have continued to sour relations down the centuries. "Will England invite a sorry and embarrassed Scotland back into a Union a few decades hence? Will the resentful and stubborn Scots who voted for "independence" be able to swallow their pride and cast their vote a different way next time? Will conservative England, by then a small-state, low tax economy with control over its borders and its way of life, feel that an influx of 60 Scots MPs, of various socialist hues, be of benefit to its people?" People never admit their mistakes, so there is no way that the Scots would ever seek to return to the UK (if they voted to leave) however bad their situation became. It is probable that a succession of left-wing governments would get elected. In turn, talented Scots, and businesses, would move South of the border (and doubtless be condemened for this by said left-wing politicians). It would be a lose-lose situation all round, as I doubt if we English would benefit from having an increasingly impoverished State to the North of us (doubtless blaming everyone but themselves for their woes). There will be enough prudent Edinburgh economists with traces of Adam Smith's genes in their DNA, and enough sensible and robust highlanders to point out that the blame lies within, Sean Fear. But otherwise I agree with you. "an increasingly impoverished State to the North of us" - a North Korea, if you like, ruled by Kim Jock Il. This is an excellent poll for the Conservatives. Polls always underestimate Conservative support in Scotland- we get about 5 % more. That indicates some good gains; Secondly- the SNP has a conservative flank- when faced with the REALITY of the SNP winning, watch that flank fall in behind the Tories- Perth and Angus- easy gains- write them in. Denis Cooper as absolutely right. The EU - as ever - will be back for more. I wonder what planet Islington Mike is living on? "It is probable that a succession of left-wing governments would get elected. In turn, talented Scots, and businesses, would move South of the border (and doubtless be condemened for this by said left-wing politicians). It would be a lose-lose situation all round, as I doubt if we English would benefit from having an increasingly impoverished State to the North of us (doubtless blaming everyone but themselves for their woes)." Thanks for that wonderful endorsement of the 5 million Scots who live North of the Border. Just out of interest, what happens if this wee country rich in natural resources (not just oil and gas by the way), finds that it is in demand to provide for the energy needs of its nearest neighbour? In might not end up just so impoverished and something tells me that it might be little englander's who end up blaming everyone but themselves for their woes, just a thought! Renewable energy or nuclear power stations not just oil and gas seem to be ideal for the wonderful large expanse of uninhabited area's of Scotland, how is England doing in that department? 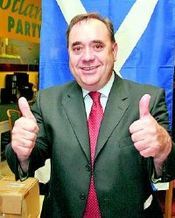 "Thanks for that wonderful endorsement of the 5 million Scots who live North of the Border." The vast majority of them vote for parties that are hostile to private enterprise, and believe that a massive public sector is the route to economic prosperity. Do you really think that such a society is one that businesses would find attractive following independence - particularly when both the Irish Republic and the rest of the UK would be a good deal more welcoming? Natural resources aren't going to make up for economic illiteracy. You seem to be forgetting that once Scotland has gained its independence it will spontaneously drop off the end of the island. On an alternative scenario, nothing at all will change except that English taxpayers will benefit massively and will vote in Tory governments for eternity, and if we want to base our armed forces in Scotland we'll just tell the Scots that we're taking some sovereign base areas. I'm sure that most of the people who have posted stupid comments above are genuine English village idiots who haven't given a moment's thought to the long term implications for England if Scotland regained full independence. Others might be europhiles who want to break up the UK for the benefit of the EU. As an English patriot I am entitled to demand a referendum on English devolution. I simply want to be an Englishman living in an English Nation recognised as a Nation. It is not my wish to see scots swinging in the wind on the gibbet of independence unless they wish it. There will be a referendum in England on scots independence and that will close the issue. For all their brave talk I suspect the scots have not got courage to go it on their own. We the English will help unstintingly as we have done for 300 years sever this warm and respectful alliance. The Conservative Party used to be very strong in especially rural Scotland which was some of the most Unionist parts of the UK, in October 1974 Labour did better in England than they did in the UK as a whole and than they did in Scotland in terms of percentage vote, the Conservative vote across England has been below 35% for the past 3 General Elections - if the UK was to be split up tommorrow with the MP's in each part becoming MP's in the new countries in their local constituencies then Labour would have majorities in England, Scotland, Wales and England with Ulster being DUP - Labour with about 32% of the vote in England won a majority of the seats, in terms of the vote though for the Conservatives it was hardly a great success in England - they got a bit over 34% in England, with the system for electing the Scottish Parliament it would have seen a minority Labour government in England, indeed it is possible that Labour might at the next General Election might again get more votes in England than the Conservatives as mostly they have done in General Elections in the UK where they have won an overall majority. Dennis, I am very pro the Union but very anti the assumption that Scotland does not contribute to the UK economy. I resent the often heard comments that we are this poor leftie bunch of people who sponge of their poor neighbours south of the border. We are not leftie, sponger's or the poor relation. We at the moment have elected a large number of Labour MP's locally and nationally, but you know what so has England and Wales! But if you want to lay the blame for all your angst at the present Labour government at anyone's door how about starting closer to home. What if people in the north of England start to think: as the Tories care so little about the Scots and want to get shot of them, what do they think about us? What is happening now is the natural consequence of more than three decades of southern Tories not caring much about what happened in Scotland - starting even before Heath decided that the Scottish fishing industry could be sacrificed on the altar of European integration. Anon, it isn't me who's assuming that Scotland doesn't contribute to the UK economy - re-read what I wrote. There's a serious statistical anomaly, that when per capita GDP is used to compare productivity across the UK there's never any correction for different local prices and wages. Consequently, for example, a bricklayer in London adds more to the GDP statistic than if he laid exactly the same number of bricks in another part of the country where wages are lower. Yet these differences in per capita GDP are then held up to show that Londoners are the most productive workers in the country, etc, when in reality it only reflects the fact that London is the place with the highest cost of living, and therefore wages. Cameron will have to be clear on the Fishing Policy, before next years elections. Presently it is all over the place, and the Scottish Tories will end up paying the price. All sounds rather dire. Left, left and more left. Greens in power. Will the last person to leave Britain, geographically speaking, please turn out the lights? Dean - if the Scots' hand has been in the till, then for most of the period since 1707 it has been to put more in than has been taken back out! How about trying to make a positive case for union instead of indulging in puerile Jock-bashing? Apologies Dennis, I have just re-read your post. Hurrah for the Blueshirts - Albion awake! Are there actually any organisations or websites that want to make the case for the Union in to the 21st century? I keep hearing of all this nationalist talk, but I am a proud supporter of the Union. Yes I want England to be more confident as a country, Yes I believe Scotland has added an enormous amount to the Union and to England and yes I think we can, one day, see Conservatives back in Scotland in greater numbers. Are there any vehicles for us to express this support, otherwise we might just find the nationalist bandwagon gets out of control and before we know it - the Union will be gone. Email me with any details - if someone knows of a group or has any ideas. "Perth and Angus- easy gains- write them in." What effect does all of this have on Grim Gordon ? How can he be Prime Minister in England and, in effect, Leader of the Opposition in Scotland ? I hear the loud clucking of devolution chickens coming home to roost. I think scotland has given more to the union that people give credit. For one, it gave up its ancient ally, france for a closer internal relationship - lets not forget - if the auld alliance wasnt broken; scotland would have been a perfect staging port for that grand armee; then you would all be speaking french. When it comes to oil - companies havent even started searching on the other coast - around the rockall trough and the like; what a treasure trove awaits. And for those of you who think england could bomb scotland into submission or take sovereignty; may i point you to faslane? A socialist republic with trident; quite scary. The original Blueshirts were a uniformed pro-Franco fascistic movement in pre-war Eire. But the menace of leftism to Scotland is clear. The naturally small 'c' conservative Scots are sleepwalking into an abyss of PC leftism. The Scots Tories should reaffirm their Unionist credentials and put clear blue water between themselves and the leftist rabble. Under Murdo Fraser they will be able to do this with conviction. "But the menace of leftism to Scotland is clear." It's not only in Scotland that the population tends to be more "left-leaning" than the average for the UK, at least on the surface, at least for the present time. It seems to me that it's part of a more general phenomenon across Great Britain - the further you go from the south east of England, the more the population has turned against the Tories and has fallen into the laps of the left almost by default. There have been a number of factors. Firstly, traditional industries were intimately linked with mineral deposits, which are mainly found in the northern and western parts of the island. As those industries declined and even disappeared in the face of international competition, it was in those parts of the country that workers were most seriously affected, and where resentment built up. Secondly, London has the City, which has become an even more important part of the UK economy, and it is the capital, but the employment and wealth generated there only spreads out so far - except by transfer of tax revenues to the more distant parts of the island, which is not good for anybody in the long term. Thirdly, there have been three or four decades during which the primary focus has been on building economic and political (and even transport) links across the Channel, and naturally that puts the parts of the country furthest from continent at a comparative disadvantage. All this could be rectified - not by restoring the old industries, of course, what has gone has gone and most of it couldn't be brought back even if we wanted to do so, but by stimulating alternatives through lower business taxes, encouraging a more global trade through seaports around the island, and if necessary telling the EU where to get off if they tried to interfere - but the question is whether there is the political will to make the changes which are necessary to keep the UK intact. There's quite a lot of truth in that, Denis. But the outcome in Scotland has been particularly disastrous. The Conservatives still polled 27% across the North of England, and still have areas of solid strength there, like the Cheshire commuter belt, and North and East Yorkshire. One can't point to any area of strength in Scotland. Yet, places like Aberdeenshire would be solidly Conservative if they were located in the North of England.
" The problems really started with the way the nations of the UK came together, it didn't start in 1997 or 1999 but centuries earlier, even long before 1707 and involves a mixture of interests of aristocracy and royalty in the different nations and religious disputes and various wheeling and dealing, and especially the rather ad-hoc way that especially British constitutional affairs have always been done, so it is quite valid to be a Unionist but to feel that the way the Union came together could have been handled far better and greater efforts made to avoid setting in motion constitutional inequities that have continued to sour relations down the centuries. " Absolutely spot on . We should have had a federal United Kingdom right from the start ie since 1707 . Such an arrangement would have defused the problems that are building up . Not too late though . If we had a referendum in England for an English Parliament I reckon we would win - it would be suppored in Scotland also I suspect . An excellent way to preserve and reinforce the Union for the future . Apparently the idea of a "federal" union was discussed, but the English political leadership insisted on an "incorporating" union. England, Scotland and Ireland all had the same sovereign, at a time when the sovereign still had more control over the direction of political affairs than is now the case, so in a sense it was already a kind of "federal" system, at least in theory, with the three countries being joined through a common supreme ruler. However by then the separate Parliaments of England and Scotland had both achieved their own power sharing arrangements with the sovereign, through the insistence that William and Mary must accept the Declaration of Rights in England, and a separate similar Declaration in Scotland, before they would be allowed to take the thrones in each case. Consequently the English Parliament could only settle the succession to the throne of England, and the Scottish Parliament claimed the right to ordain a different succession to the throne of Scotland - so reversing the 1603 Union of the Crowns. They formally expressed that right in their Act of Security of ca 1703 - 4, Anne at first refusing to give it Royal Assent. As I understand, that was the last straw for the English leadership, who henceforth would only accept a Union of the Parliaments. Scotland may be lost to the Conservative Party, but the good news is that the Scots Conservative Party is not lost to Conservatives. Scots Toris find no difficulty in placing clear blue water between themselves and their appalling opponents. We should have the courage to do exactly the same. 1. "I hope David Cameron will realise how stupid he has been to pander for the Scottish vote." I haven't noticed him exactly "pander". The fact is that both Heath and Thatcher gave the interests of Scotland too low a priority in the wider, geopolitical, scheme of things. Now Blair has gone too far in the opposite direction, and given the Scots a kind of elevated status. (And they're not even Muslims!) If anybody has pandered for the Scottish vote, it's New Labour. 2. "What ever one may think of Mr. Salmon at least he is a patriot which is somthing England is short of in all our M.P.s of whatever colour, next stop a Parliament for England"
England is short of patriotic MPs, whether that's English patriotism or British patriotism. But that can only be the case because people in England have voted in MPs who are not patriotic. So why do you assume that people in England will make any better choice when they're voting for representatives in an English Parliament?